Bio - Nathan Da Silva. Musician. Composer. Performer. Nathan Da Silva is a performing musician and music educator, with a Bachelor of Music Performance degree from Carleton University in Ottawa, Canada, specializing in guitar studies under the instruction of Wayne Eagles. Nathan has performed in various settings throughout his career. His performance resume includes: the Toronto 2015 Pan Am and Para Pan Am Closing Ceremonies; numerous Carleton University Convocation Ceremonies; over 350 gigs as a cover artist in the Toronto and Ottawa bar circuits; over 180 gigs with his original progressive rock band, The Slyde, including two performances at Ottawa Bluesfest; several gigs/tours with various artists (including numerous Franco-Ontarian acts); and averaging 100+ performances yearly. Nathan currently resides in Toronto, Canada. 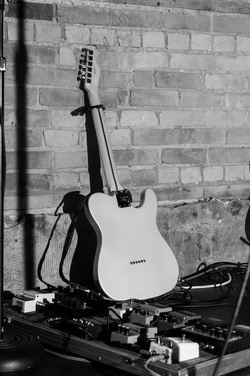 As a private guitar instructor for over 10 years, he teaches from his home in the Midtown area, and as a frequent substitute teacher at various Long and McQuade's locations in the GTA. You can catch Nathan performing: with The Slyde and other original projects, as a sideman, and as a solo performer.